I first heard about the abandoned Boeing 737 plane by You Tuber “Exploring with Josh” and thought if I ever go back to Bali, I must track this abandoned plane down. And that we did. 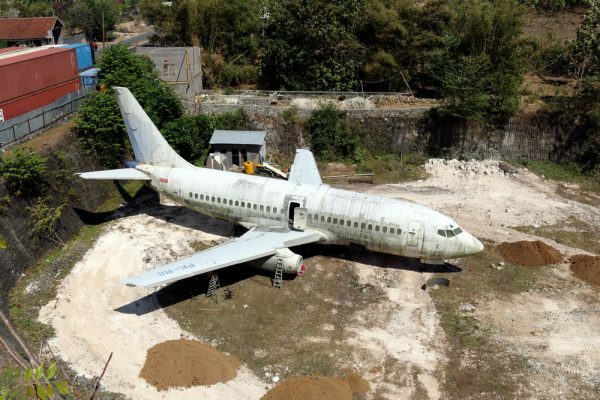 There’s not a lot of information online about how or why this plane is here, but apparently according to locals, it was supposed to be converted into a tourist restaurant but the owner ran out of money and left it to rust away. 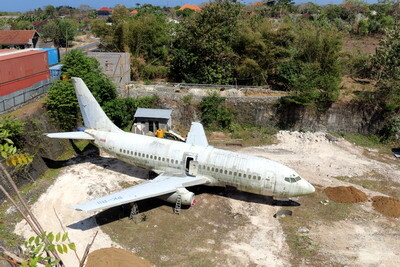 The abandoned plane is located near the southern coast of the Bukit Peninsula in Bali. 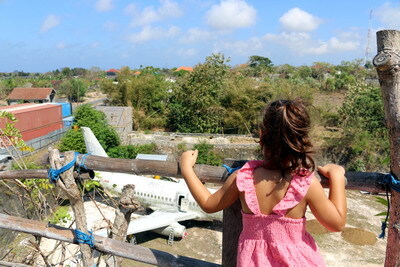 It’s just off the Raya Nusa Dua Selatan Highway and only five minutes from the popular and scenic Pandawa beach. Make sure you keep your eyes peeled for the shipping containers that hide the area, or you will miss it. You can stand on the containers for a great view and that perfect photo opportunity or you can walk up the path hidden behind a little shack to get a closer view. We were told that if you are willing to pay a few dollars, you can find a path that leads to the plane, but that was not true. Either way, it’s still a bit of a mystery why this plane is here.